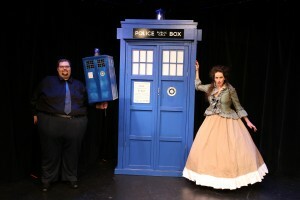 “The Doctor” opens THIS WEEK! Sep 11 – 14 only! Posted on September 6, 2014 by admin | Comments Off on “The Doctor” opens THIS WEEK! Sep 11 – 14 only! Less than a week remains until the one-weekend only return of “The Doctor” with all-new plots! Our September 11th episode will feature the second half of the cliffhanger that ended our first run – will the Doctor triumph over his nemesis, who has absconded with Emma and the TARDIS? Tickets are going quickly at Brown Paper Tickets (click here) – $12 online, or $15 at the door if available. This entry was posted in Announcements, Performances, The Doctor. Bookmark the permalink.